Comstock Bridge Progress- 9/10/03. Comstock Bridge Back Over River- 9/01/03. Comstock Bridge Progress- 8/18/03. Work continues on Comstock Bridge- 8/05/03. Work continues on Comstock Bridge- 7/07/03. Work continues on Comstock Bridge- 6/30/03. Work Begun on Comstock Bridge- 6/23/03. During the winter months when the sun favors the southern horizon, the Comstock Bridge spends much of its day in the shadow of West Hill. 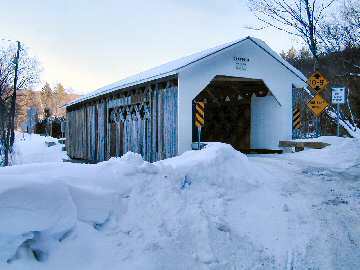 February 2, 2004 - Reopened on Thursday, November 13, 2003, Montgomery's newly refurbished Comstock Bridge appears to be passing its first winter back in service in good form. The span, built by Savanna and Sheldon Jewett, was first opened in 1883 next to the mill works of John Comstock, miller, grain dealer, and manufacturer of carriages and sleighs.